… there is no country and no people, I think, who can look forward to the age of leisure and of abundance without a dread. For we have been trained too long to strive and not to enjoy. It is a fearful problem for the ordinary person, with no special talents, to occupy himself, especially if he no longer has roots in the soil or in custom or in the beloved conventions of a traditional society. Nevinomics is dedicated to developing public policy and economic approaches based on maximizing individual Flourishing. Our obsession with maximizing GDP leads us to policies and conclusions that in many cases do not help Canadians’ welfare and that, in some cases, harm it. Flourishing as a measurement is the ultimate goal – and not an easy goal, given that understanding and measuring Flourishing is itself fraught with difficulties. But Nevinomics is always delighted to see any movement away from GDP, such as the Human Development Index1) Part of The United Nations Development Programme: Human Development Index. Accessed August 21, 2016. or the World Happiness Report,2)See World Happiness Report. Accessed August 21, 2016. as these are all steps in the right direction – thinking more broadly and deeply about what the economy is for and that it serves us to make life better. And in Canada, we do have people thinking more deeply. The University of Waterloo’s Centre for the Canadian Index of Wellbeing is doing critically important work to show us that GDP is only tangentially related to improvements in human welfare.3)See Canadian Index of Wellbeing. Accessed August 20, 2016. In fact, in the CIW inaugural report, they discovered that while there were significant gains in GDP in 1994-2008, the gains in well-being were modest, demonstrating once again that GDP is a poor measure to aim to maximize. 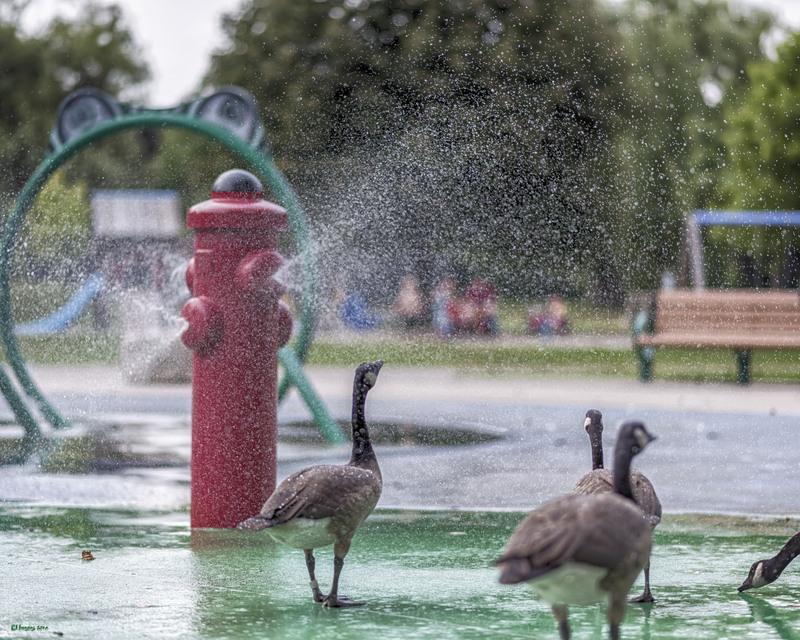 The Canadian Index of Wellbeing is structured upon a framework of 8 dimensions – Education; Living Standards; Community Vitality; Democratic Engagement; Healthy Populations; Time Use; Leisure and Culture; and the Environment. These dimensions are combined into a single metric, which forms the Canadian Index of Well-Being. The results are fascinating, critically important… and depressing. In CIW’s methodology, 1994 is indexed to 100. From 1994 to 2008, GDP per capita has grown about 30%. This sounds like terrific progress, with about 2/3% per year in increased incomes. However, every one of the 8 sub-indices has improved less than 30% and, in two cases – Leisure and Culture, and Environment – we have gone backwards, with the index significantly less than 100 in 2008. In the case of time-use, 2008 is stuck at 100, the same as 1994. 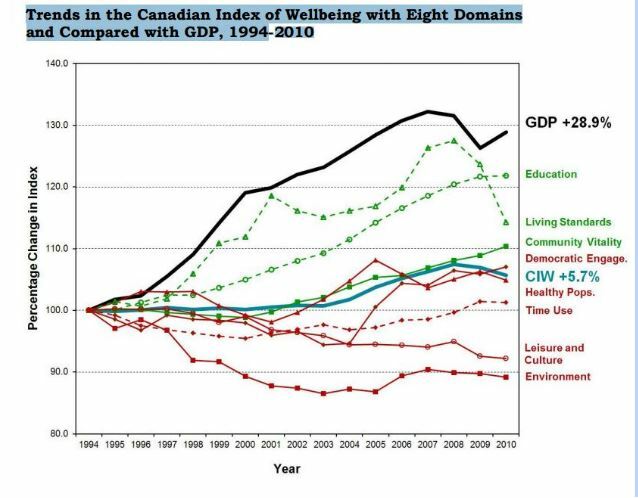 CIW Chart Showing Trends in the Canadian Index of Wellbeing with Eight Domains and Compared with GDP, 1994-2008.4)From How Are Canadians Really Doing? : The 2012 CIW Report. Accessed August 21, 2016. Overall, the CWI shows that despite massive gains in income (per capita) Canadians are not much better off – something that many of us feel at a visceral level. CWI’s analysis illustrates vividly why we must move away from GDP-based measures to guide public policy – because development of policy based on measuring the wrong thing will always be sub-optimal. At the end of the day, policy should be based on pursuing the right objective and looking at the evidence. An excellent example of this is the evidence from Sweden on the six-hour workday.5) I have written about this on the blog before. See “Sweden’s 6-Hour Work Day” for discussion and citation. What we are finding is that output in 6 hours is as good or better than output in 8 (or 10 or 12) hours, something that is not surprising to me when I consider carefully how long I can concentrate on complex tasks, the type of tasks that form more and more of modern work. And the 6-hour day addresses many of the well-being index issues – leisure time being a key one. So please have a look at the work of the Canadian Wellbeing Index.6) Canadian Wellbeing Index. Accessed August 21, 2016. They are trying to take us in the right direction and we will all benefit if we listen. Photo: El Neill; El Imaging 2016. All rights reserved. 1. ↑ Part of The United Nations Development Programme: Human Development Index. Accessed August 21, 2016. 2. ↑ See World Happiness Report. Accessed August 21, 2016. 3. ↑ See Canadian Index of Wellbeing. Accessed August 20, 2016. 4. ↑ From How Are Canadians Really Doing? : The 2012 CIW Report. Accessed August 21, 2016. 5. ↑ I have written about this on the blog before. See “Sweden’s 6-Hour Work Day” for discussion and citation. 6. ↑ Canadian Wellbeing Index. Accessed August 21, 2016.